15th January 1893, Llwyn-yr-Eos (Grove of the Nightingale in Welsh), Cowbridge Road East, Cardiff, Wales. Christened David Ivor Davies. Ivor Novello’s father was David Davies, a tax collector and his mother was the celebrated Welsh singing teacher, Dame Clara Novello who founded the Welsh Ladies Choir. 1916: Ivor Novello received a commission as a Sub-Lieutenant Officer in the Royal Naval Air Service and trained as a pilot. He crash-landed on his first and second solo flights and he was therefore grounded and put on clerical duties for the rest of the First World War. 1917: He composed while he was still in the Navy and his musical, “Theodore & Co” became a wartime hit. 1918: He was known by his stage name as Ivor Novello for the first time. 1926: He went onto the London stage occasionally playing dramatic roles such as in the first London production of Ferenc Molnár’s play “Liliom”. 1927: In January he legally changed his name to Ivor Novello. He went into cinema and starred in silent films produced by Alfred Hitchcock. He starred in a screen version of Noel Coward’s play “The Vortex” in London. Coward commented that Novello always looked stiff in front of a camera and was always more natural on film. 1930’s: He appeared in numerous highly costly and spectacular West End musicals during this period and it was the stage which was his first love. His stage works were often written in the style of operettas. He was also known for his extravagant “gay” lifestyle. He had a long term relationship with the British actor Bobbie Andrews and had affairs with numerous other people including the poet and writer Siegfried Sassoon. He frequently wrote his own librettos as an accomplished playwright but most of the lyrics for his shows were written by Christopher Hassal. 1933: Brought the actress Zena Dare out of retirement and began to write parts for her. 1935: Directed a production of “Glamorous Night” which cemented his reputation. 1939: Directed “The Dancing Years” and then flirted with Hollywood. 1944: In May Ivor Novello was sentenced to eight weeks in prison (serving only four) for misuse of petrol coupons which was seen as a major offence during World War Two. A female fan had got the fuel via her employer. This period when he moved from a glamorous lifestyle to prison life broke his spirit and he was never the same again afterwards even though he continued to perform up until his death. The annual awards of the Performing Rights Society to song writers and arrangers are named Novello Awards in his honour. Never married as homosexual. (Homosexuality was illegal in England and Wales until 1967). He was the lover of the British actor Bobbie Andrews for over 35 years. 6th March 1951, London, England from a coronary thrombosis. Funeral at Golders Green Crematorium. 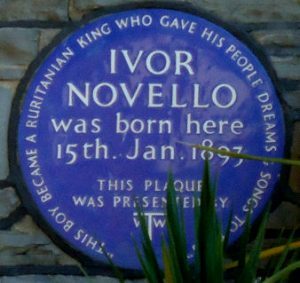 His ashes are buried beneath a lilac tree which has a plaque inscribed “Ivor Novello 6th March 1951 ‘Till you are home once more’. 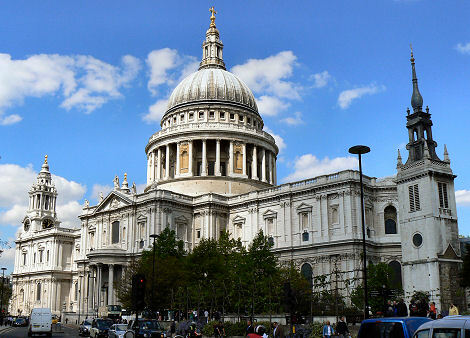 There is also a memorial plaque in the Crypt of St. Paul’s Cathedral, London. There is a Blue Plaque on the house he lived at “Redroofs” in Littlewick Green. The Ivor Novello Appreciation Bureau hold a pilgrimage to Redroofs in June each year. 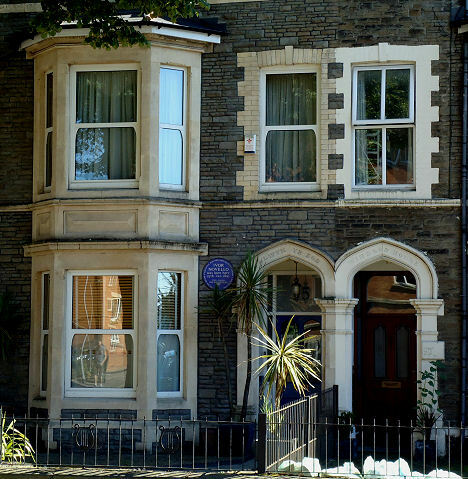 Blue Plaque on his birthplace in Cowbridge Road East, Cardiff. 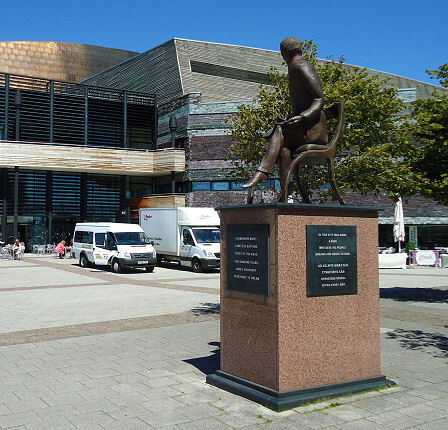 Statue outside the Wales Millennium Centre in Cardiff Bay.